September was Hunger Action Month, and one San Diego foundation wants to inspire you to help solve hunger across the border. The International Community Foundation is leading the fight against food insecurity in Baja California Sur, the Mexican state in the southern part of the Baja peninsula. The U.S. federal government defines it as a situation where people have limited or uncertain access to nutritionally adequate and safe foods. This can lead to conditions like hunger, or, due to disproportionately high prices of fresh food and low prices of processed or fast food, obesity and other diet-related diseases. What’s the situation in Baja California Sur? High food prices in Baja California Sur prevent those who live in impoverished conditions — seven out of 10 homes — from buying fresh, healthy foods. The lack of a nutritious diet may lead to obesity and other diet-related conditions. In addition, the area receives migrants from other parts of Mexico every day who are separated from their traditional production and ingredients; lack family assistance in meal preparation; and often are households where both parents work. Prioritizing healthy home-cooked meals is difficult. It was not a surprise then that community surveys conducted in 600 households in La Paz and Los Cabos revealed a dire reality: The people of Baja California Sur are in a state of hunger. They’re nutritionally depleted. As many as 52 percent of at-risk individuals reported that, on a weekly basis, their families couldn’t afford the quality food that’s available in their communities. Some food assistance programs do exist in the area, but they simply aren’t able to offer enough help to these families. Isn’t Mexico a top producer of food? Yes. When they gather around the dinner table, American families may not realize their delicious fresh vegetables and fruit probably came from regions like Baja California Sur and likely contributed to the $21 billion of imported agricultural products from Mexico in 2015. In fact, Mexico is the largest supplier of fresh and frozen fruit to the United States, and it’s the second-largest supplier of agricultural imports. How is the International Community Foundation helping? 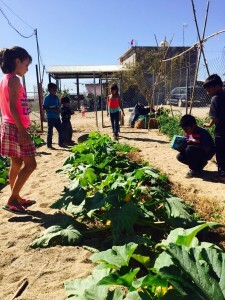 The foundation is uniquely positioned to lead the fight against hunger by capitalizing on its extensive relationships with organizations in Baja California and with donors in the U.S. In 2014, ICF incubated the Southern Baja Food Security Alliance, a partnership of social, government and business organizations in the state. Their collaborative mission is to improve food security. Join the International Community Foundation’s mailing list to learn more about these food security and other cross-border efforts and events. What are some of the foundation’s strategies? One goal is to increase fresh food consumption by increasing access to healthy produce through existing community gardens and kitchens ICF and its partners are combatting food scarcity through nutritional awareness programs at the state-run SEDESOL Community Kitchens and Gardens, such as those operated by Raiz de Fondo in La Paz. This is a comprehensive strategy that trains adults and young people to harvest, access and prepare fresh, healthy food. Two on-site production gardens in La Paz and Cabo San Lucas have inspired a program that’s now expanding to San Jose del Cabo and will include a total of six gardens. Is there a way to work with food producers in Mexico to bring more food to those in need? Yes! The foundation is sponsoring the Food Rescue Program, which harvests produce that’s grown in Mexico but doesn’t meet the stringent export standards of countries like the U.S.
Gleaning – the practice of collecting and donating excess foods – simultaneously address the pressing issues of hunger and food waste while fostering strong community food systems. Because it requires so much effort and coordination. ICF is hoping to establish a food rescue center and two distribution centers in Baja California Sur with local partners this coming year. One center will rescue 2.5 tons of fresh food monthly from 10 producers, and the other will salvage prepared foods from local restaurants and hotels where food is wasted daily, particularly in the luxury hotel area of Los Cabos. What is the foundation doing to combat obesity? You can make a real difference this Hunger Action Month in the fight against international hunger. 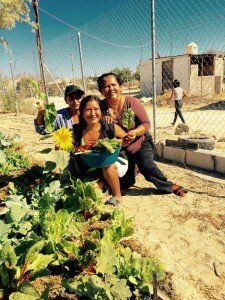 Your donation to the International Community Foundation’s Southern Baja Food Security Alliance fund or local partner Raiz de Fondo will help countless families in Baja California Sur. To give, please visit donate.icfdn.org or contact Eliza Brennan, Marketing and Development Manager at 619-336-2254, or e-mail her at eliza@icfdn.org.